This photograph was posted on the Facebook page of the Barnstaple History Group by Angie Fisher in July 2015. It gave rise to a lot of comments which identified, although didn't always specifically place, some of the people who gathered in this crowd on Mill Road sometime, it is thought, in the early 1940s. The absence of men suggests that it might have been wartime. For example, it includes Mavis Eastaugh's grandparents, and she also expected it included members of the Rigler, Draper, Cricks, Harding and Peters families amongst others. The building was identified as Lethaby's wood store by Chris Eastaugh who said that it still is in the cut between Mill Road and Rolle Quay. Barry Hancock identified the shed as where his father started his tractor repair business in 1961. Marion Jones identified the woman in the hat, top left, as her grandmother, un-named, and the woman sitting on the floor bottom left as her Aunt Mabel Williams. Pat King identified her mother, on the right of the picture, and placed it pre-1943. Margy Hill identified her husband Bob's mum standing just in front of the lady with the hat and glasses in the open doorway - next to the lad in the jacket with a striped tie. His sister Muriel is in it as well as probably is Vernon Morrish. Maureen Raine identified Raymond Saunders, back row 4th on the right, and his sister Margaret, 6th on the right, of the lady with the hat. Their mother, Josie Saunders, is behind behind the gentleman. Carol Cole identified her mum, Teresa Hill, in the 2nd row back with the crown on holding a little girl's hand. She also thought that Muriel Hill is the woman in the nurses outfit in the front row. Lindsay Lewis identified her mum, Joan Easton, as 2nd in from right in the second row. 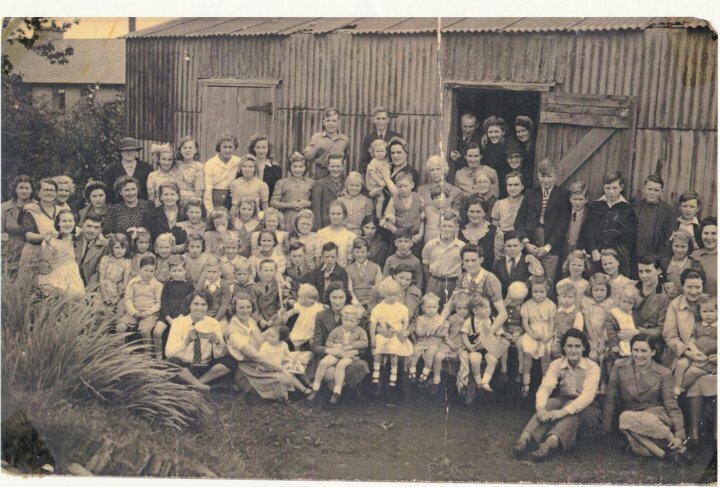 Ian Andrews thought that the woman sitting in the centre front was his grandmother with his dad. Thanks to all who contributed. If you can add any names or complete any other information, we would love to hear from you.